A perfect choice for a honeymoon or weekend getaway in New Hampshire, this special room at Martin Hill Inn welcomes you with a sunny porch and private entrance. 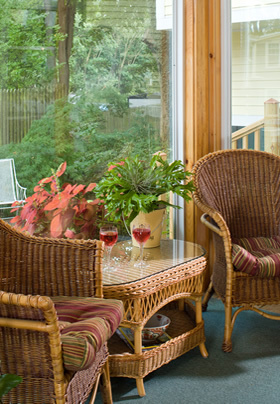 Before breakfast, take pleasure in the solitude, listening to the comforting sounds of the water fountain while sipping your first cup of coffee on the sun porch, or spend some time before dinner relaxing on the double bench seat with a glass of wine or iced tea. 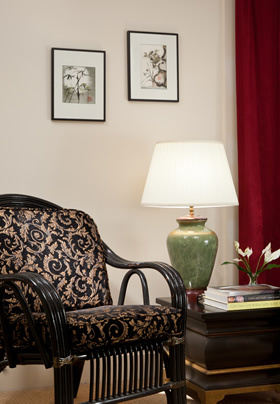 The Noonday Suite features a plush king-size bed, an antique mahogany writing table, and a cozy sitting area with flat-screen TV, and two armchairs. The private en-suite bathroom features a bathtub/shower combo unit. Adorning the walls are original Chinese brush paintings by a local artist; these paintings were the inspiration for the bed hangings. One of our most popular rooms, this first-floor suite is located in the Guest House. The clipper ship “Noonday” was a medium-sized vessel measuring 200 feet long. She made four successful trips to San Francisco during her short career. In 1863, carrying $600,000 worth of cargo to San Francisco, she struck a rock. All crew members escaped on lifeboats before she sank in 240 feet of water. Not a very exciting career, but the name reflected the brightness and sunshine we find on the porch of Noonday’s room. Amenities: King-size Bed, Wi-Fi, Flat-screen TV, Sitting Area, Air Conditioning, Private Bath with tub/shower, End-Table Refrigerator, Private Entrance, Private Sun Porch, Sherry, Water, Chocolates, and Snacks. Minimum night stays apply. Rates are subject to change. “Breakfasts were delicious, especially the pancakes! Teas were delicious. We thoroughly enjoyed our stay and hope to come back some day.” Bob & Kathy, England.